Following the Setting the Agenda Event in May, the Emerging Ideas event on 22 June will allow you to review initial ideas, help refine proposals and inform a prioritised action plan for a new Central District Regeneration Framework. 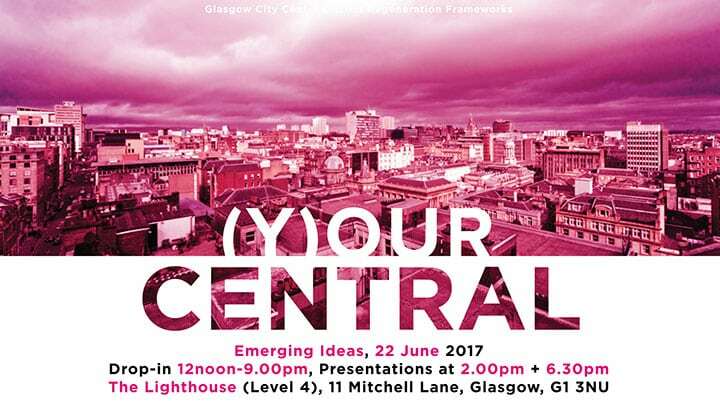 Drop-in at The Lighthouse (Level 4) anytime from 12noon til 9pm on Thursday 22 June to share your ideas and help shape the regeneration of (Y)our Central over the next 10 years. Come along to presentations and workshops at 2pm and 6.30pm to review and refine the Emerging Ideas. Smart Cities adopt a ‘system-of-systems’ approach to service delivery and develop collaborative service models to focus on shared outcomes across organisational boundaries. Smart Cities make best use of data and digital technologies to invest in enhanced openness and transparency that promotes citizen and business engagement in, and ownership of, service reform. Cities and their citizens generate a huge amount of data which can be used in smart ways to achieve great things. Stepping boldly into the future, Glasgow developed an OPEN Data platform that allows the city and organisations to automate the publication of their data, allows it to be stored and makes it available on a large scale so that it is easy to access data.glasgow.gov.uk. It helps make the publication of open data sustainable for everyone in the city and helps us to understand and shape Glasgow in new and surprising ways. The Glasgow Operations Centre is a state-of-the-art integrated traffic and public safety management system created with the help of Future City funding. By bringing together public CCTV, Glasgow Community Safety Services, Traffic Management Services and the Resilience and Safety Team, this centralised hub can assess and respond to situations large and small across the city. It also helped facilitate and safeguard the Glasgow 2014 Commonwealth Games. The Intelligent Street Lighting Demonstrator showed how the city can use smarter streetlights to improve lighting quality, reduce energy usage and make maintenance more efficient. The pilot scheme also collected useful data that could have a positive impact on the quality of life and public safety in the two test locations, Riverside Walkway and Gordon Street, such as noise detection, movement detection, air pollution detection and WiFi service. The Active Travel Demonstrator showed how the city can be made friendlier for both cyclists and pedestrians, and had the potential to inform strategies that could help Glasgow reach the Scottish Government target of 10% of all journeys being completed by bike. The Integrated Social Transport Demonstrator helped some of Glasgow’s most vulnerable citizens access social and educational services. Smart integration and route scheduling software will increase flexibility and responsiveness, while also reducing operational costs and making it easier for the same transport to be used across various organisations. The Future City Glasgow programme has provided a strong platform for Glasgow, it is already unlocking new projects and funding opportunities. We want to ensure that the significant benefits can be realised from the ‘network effect’ – as data, technology and people are joined together. This exponentially magnifies the potential benefits, impact and value that can be delivered. 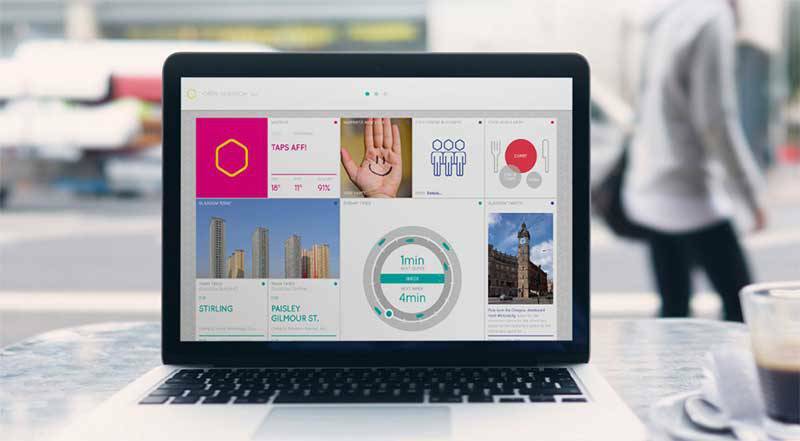 The Smart Cities Maturity Model and Self-Assessment Tool draws on and adapts existing models and frameworks in this field, and was developed with the Scottish Government and Scottish Cities Alliance to use with all seven Scottish cities. It helps cities understand their position on the journey towards ‘smart’ and is designed to walk cities through the process of clearly understanding current activity, identifying next steps, and gaining an appreciation of the actions and resources required to realise their ambitions. Furthermore it supports the development of business cases to unlock investment and resources required to realise and take advantage of the opportunities delivered by a ‘system-of-systems’ smart city approach. Investment in digital technologies and improved data management alone will not however deliver the Smart City. Over time cities need to consider the strategic intent, governance and service delivery models that exist together with their approach to citizen and business engagement if they are to secure the maximum impact from their investments. The ultimate vision is of a Smart City that strategically manages multiple systems at a city-wide level and through increased transparency, openness and shared accountability creates an innovation system that improves outcomes and enhances city competitiveness. What does the term “smart city” mean to you? Do you know of any smart city projects worldwide? If, yes what is your favourite? Generally speaking, do you think Glasgow is “innovative”? Please list one or more things that would in your opinion make Glasgow smarter/more innovative? What smart city projects would you like to see in Glasgow? Glasgow City Council have appointed a team led by MVRDV and Austin-Smith:Lord, supported by Space Syntax and a multidisciplinary team, to develop with stakeholders and local communities, Regeneration Frameworks focusing on four districts within the City Centre: Broomielaw, Blythswood, St Enoch and Central. To inscribe local knowledge at the heart of the process right from the start, there are currently a whole series of engagement events to listen to, learn from and engage with local people, agencies and stakeholders. 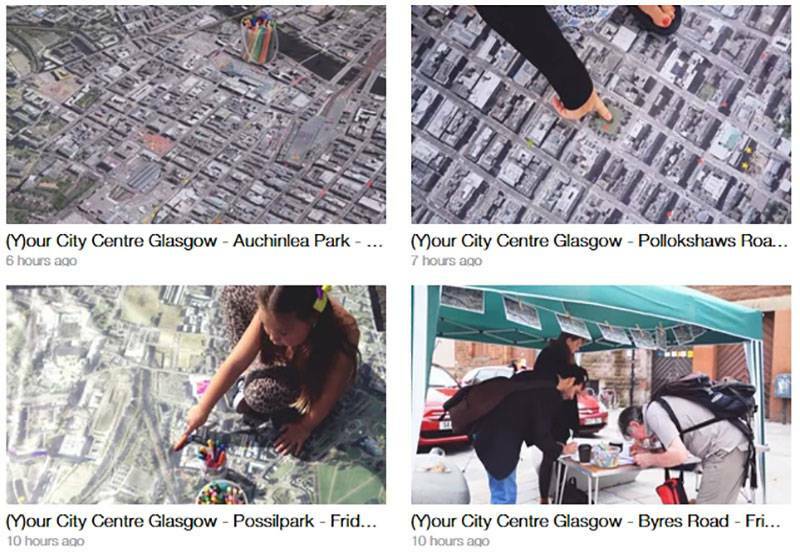 As part of this process, a team from art organisation WAVEparticle, who specialise in creative community engagement, were out and about on the streets of Glasgow, inviting people to share their ideas to help shape the future plans for the city centre. Before embarking in conversations within the city centre, the team started by visiting four neighbourhoods outwith central Glasgow. These ‘satellite’ engagement events were deliberately located north, south, east and west of central Glasgow specifically to gauge why Glaswegians use (or don’t use) their city centre. These on-street engagements took place over Friday 26th and Saturday 27th August, when the team, including Lead Artist Peter McCaughey, artists Lauren Coleman, Lauren Bishopp and Zöe Hyatt, and filmmaker Basharat Khan, set-up a gazebo at Byres Road, Possilpark, Pollokshaws Road and Auchlinea Park. With the aid of a large vinyl floormap of Glasgow, an interactive online survey and a Postcard From The Future, (which invites people to imagine Glasgow in 10 years time, and the changes they’d like to see in the city), the WAVEparticle team engaged passers-by in conversation, asking them to think about their city centre – what’s good about it, what needs to be improved / changed, and what would make them use their city centre more often. The response from the public was terrific and we are grateful for the honesty and enthusiasm from everyone we met, including the children we met outside The Possilpark Health and Care Centre on Saracen Street, who took to the big map with felt-tip pens because they felt the city centre needed a bit more colour. These 4 short films are a reflection of what people said, giving a real insight into people’s views and opinions about the city they live in. Thank you to all who contributed in any way and for sharing their ideas for the future of (Y)our City Centre. 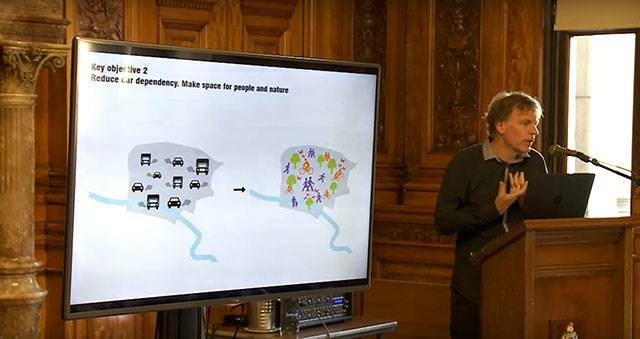 The next phase of Glasgow’s City Centre Strategy was formally launched on Monday 29 August by Cllr Frank McAveety, Leader of Glasgow City Council. The (Y)our City Centre project will develop plans and ideas for Blythswood, Broomielaw, Central and St Enoch by understanding what works well and what should change to make these city centre districts even better. A team, led by internationally renowned architects MVRDV working with local consultants including Glasgow-based designers Austin-Smith:Lord, will engage with those who live in, work in, study in and visit these areas to come up with proposals to make Glasgow city centre an even more attractive place. Watch a video of the Launch event with key speakers including the Leader of the Council and Winy Mass, Co-founder of MVRDV. The (Y)our City Centre team are keen to hear your views. Sign up for regular updates below and share (Y)our Ideas to improve Glasgow city centre via the website, social media and at forthcoming events. Glasgow City Council have appointed a team led by MVRDV and Austin-Smith:Lord, supported by Space Syntax and a multidisciplinary team, to embark on the design of District Regeneration Frameworks for four districts of Glasgow City Centre. These Regeneration Frameworks will look to create a clear urban structure to realise Glasgow’s economic, cultural and social potential. 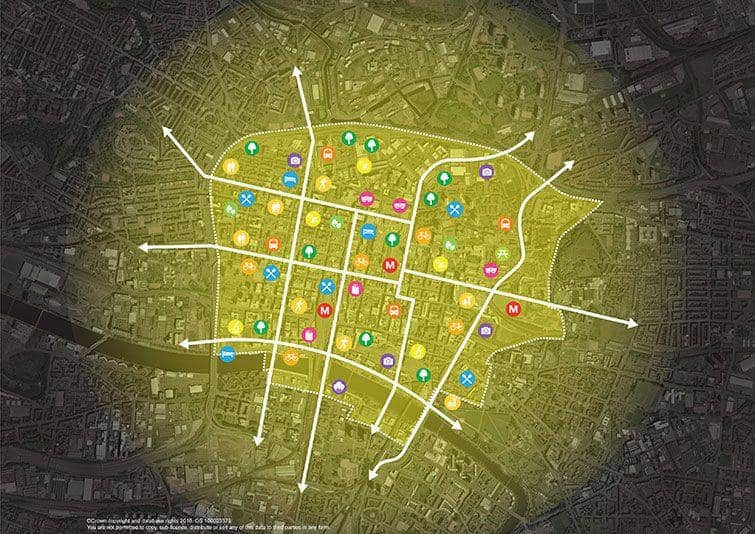 The project will focus on the areas comprising Broomielaw, Blythswood, St Enoch and Central as part of the city’s ambitious City Centre Strategy. Today Glasgow’s city centre is a wonderful historical ensemble but it faces – as with many post-industrial cities – challenges including some vacant buildings, under-utilised plots, changes in retail patterns, city centre living, public open space, safety and traffic. The full team also includes Urban Tide, Douglas Wheeler Associates, WAVEparticle, Ryden, Arup, Gerry Grams and Gardiner + Theobald.